BREAKING NEWS: Apple iCloud service to launch in the UK, iPhone 4S on sale October 14th | What Hi-Fi? Apple will announce later today that the iCloud music storage service is due to come to the UK next. And the new iPhone 4S is expected to go on sale from October 14th. The Guardian reports that the 'iTunes in the cloud' service, which launched in the US in June, will now roll-out across Europe with the UK the first territory to benefit. The launch will allow users to store music, videos and photos in the cloud and access them remotely and wirelessly from their Apple devices. Key content providers have been negotiating with Apple over the terms of the service, and details are now reported to have been finalised for the UK. Follow our live coverage of tonight's Apple event, which is also expected to see the launch of the iPhone 4S and the discontinuation of the iPod Classic, from 6pm. OK, now we've had time to digest all the news coming out of Apple's WWDC event last night, we can clarify a few further points regarding iCloud and iTunes Match. 1) Is iTunes Match on iCloud for the US only? At this stage, yes. Apple has not yet confirmed a date for release in the rest of the world. The company has given itself a year to get the music labels in other territories on board. 2) What happens if I already have a MobileMe account? MobileMe will officially die on June 30th, 2012. In the meantime, existing users will automatically have their subscription extended for free until that date. After that, if you sign up for OS X Lion/iOS 5 you'll get iCloud for free. You'll be able to keep your MobileMe email address, and move your mail, contacts, calendars and bookmarks to the new service. 3) Are iTunes syncs included in the 5GB storage limit? As far as we know, only the songs that have to be uploaded from your collection because they're not found on the iTunes Music Store will count against your limit. 4) Will iTunes on iCloud stream my music? No, it's a download for the free element (ie music you previously bought through iTunes), while iTunes Match will also be a download service, not streaming. Streaming is more expensive and harder to cache than a download. 5) Will I be able to download videos via iCloud? No, not yet. Video takes up far more storage, and Apple doesn't have the necessary deals with the film and TV studios. 6) What happens if I stop paying for my iCloud Match service? The annual fee is $24.99 in the US (so we'd guess around £20 in the UK). Stop paying and you should still be able to access your paid-for iTunes music on any iOS device, but your uploaded music and the rest of your library will have to revert to being stored in one place such as a hard drive. 7) Can I buy more storage than the 5GB Apple will give me for free? Yes, an additional 10GB is £14, 20GB £28 and 50GB £70. 8 When will I be able to buy Mac OS X Lion? It will be available as a download from the Mac App Store for £20.99 in July. OK, that's it folks. Mr Jobs has left the building. Apple's press releases have just arrived, so if we discover any more we'll be sure to post it here. iCloud launches in developer beta form today. It will be set up by default on new iOS 5 devices, and you'll get 5GB of storage for mail. iTunes in the Cloud runs on iOS 4.3 beta. 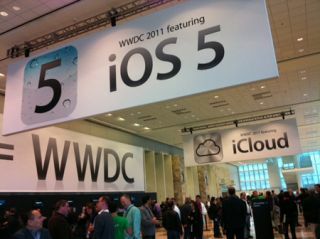 iCloud will ship this autumn at the same time as iOS 5. As for songs you've ripped yourself in iTunes, you can sync them to your multiple devices using wi-fi or a USB cable, or you can use iTunes Match to scan your music library and upgrade those songs to 256 Kbps AAC, DRM-free. Scan and Match will cost $25 a year, regardless of how many songs you have. Finally! iTunes in the Cloud. As with photos, documents etc iCloud will allow you to download any music you've bought on iTunes to multiple devices "at no additional charge". There's a new "Purchased" tab in iTunes. You can look at all your albums find anything you like, and then just hit that cloud button to download it to whichever device you're using. Presumably this won't work with "non-purchased" music you've ripped yourself. Purchased songs will play at 256Kbps AAC and can be pushed to up to ten iOS devices. "So that's iCloud. It stores your content and pushes it to all of your devices, and it's integrated with all your apps," says Jobs. Apps can store documents in the iCloud and automatically push them to the user's other devices. Works across all iOS devices, and Macs and PCs too. Photos stored in iCloud will now stream to Apple TV too. Your iDevice will store the last 1000 photos you've taken for 30 days. Jobs is back on stage. "I'm going to talk about iCloud. We've been working on this for some time now, and I'm really excited about it." Users now want all their content on all devices all the time. "Keeping these devices in sync is driving us crazy. So we've got a great solution to this problem... we're going to demote the PC and the Mac to just be a device." "We're going to move the digital hub, the centre of your digital life, into the cloud." So you can take photos on your iPhone, push them up to the cloud, and then back down to your iPad. "iCloud stores your content in the cloud and wirelessly pushes it to all your device. It automatically uploads it, stores it, and pushes it to all your devices." Mmm, sounds a bit like MobileMe was supposed to be. Jobs admits MobileMe "was not our finest hour". All MobileMe apps have been rewritten from the ground up to work on iCloud. No mention of music streaming yet. iCloud will be free, unlike MobileMe, which ceases to exist from today. Apps will be shared across all iOS devices via iCloud as well. Purchased music, books, photos and videos, device settings, and App data will be automatically backed up daily via wi-fi to iCloud. New iMessage client enables text messaging between all iOS users, regardless of device. Supports iPhone, iPad, and iPod touch. Lets you send text messages, photos, videos, contacts, and even do group messaging. Works over wi-fi or 3G. AirPlay mirroring will let you mirror your iPad wirelessly to the TV. And sync youriTunes library over wi-fi too. iOS 5 will ship this autumn and will support the iPhone 3GS, iPad and iPad 2, plus the third and fourth generation of iPod touch. Ah, this is good. Finally breaking the link with the Mac/PC for set-up so you don't need a wired connection to iTunes to get started. Now, when you take the phone out of the box, you just see "Welcome" instead of a prompt to tether it. "You can now set up and activate your device right on the device and you are ready to go. It's that easy." Software updates will be over-the-air as well. About time. New Game Centre allows users to purchase and download games directly, without being connected to a computer. Apple says it wants to make it easier for customers to use Twitter on all its iOS devices. Twitter now integrated with many apps, including Camera and Photos. Tab browsing and Reading List added to Safari browser for mobile. Camera updates include a camera button on the lock screen, so you can get straight to it, the ability to use the 'volume up' button to take pictures and edit them on the iPhone or iPad. Oh, and the keyboard on the iPad now splits in two if you use just your thumbs rather than all your fingers for typing. "Let's talk about the future of iOS, and that is iOS 5. iOS 5 is a major release." It has 1500 new APIs. New Notification Centre aggregates all notifications and is accessed by swiping down from the top. Newsstand enables instant subscriptions to a range of magazines from your iOS device. Looks like iBooks library. New issues are automatically downloaded in the background, available offline to read. At last! On to iOS for iPhone, iPad and iPod Touch. Apple has sold 200 million iOS devices to date, including 25 million iPads. More than 15 billion songs sold through iTunes, and 130 million book downloads. Quite a lot then. And there are now 90,000 apps for the iPad. To date, 14 billion apps have been downloaded from the App Store. Still rattling on about OSX Lion, peer-to-peer wi-fi sharing, FaceTime and new mail system. Lion will be available to buy in the App Store, downloads directly to your Mac. So no more discs. It's a 4GB download, available July, will cost $29.99. Lots of stuff about Lion and the Mac App Store. Come on guys, we want to hear about iCloud and iOS 5! Phil Schiller, senior vice president of product marketing, takes to the stage to talk about OSX Lion. There are 54 million Mac users around the world. Lion has 250 new features, including multi-touch gestures and full-screen apps. Mac App Store is "now the No.1 channel for buying PC software". App Store is now built into Lion. OK, expecting Steve Jobs on stage any minute now. And here he is. Apparently there are 5200 attendees at WWDC 2011. Sounds like software will be the core theme, as we expected. "If the hardware is the brain and the sinew of the product, the software in the middle is the soul," says Jobs. "We've got some great stuff to talk about: OS X Lion, iOS 5, and some kind of interesting new cloud stuff." No surprises there then. Right, we're settling in for the start of Apple's Worldwide Developer Conference 2011 at which Steve Jobs is expected to announce Mac OS X Lion, iCloud media streaming and iOS 5. We're not expecting any new hardware, so iPhone 5 isn't likely to make its appearance tonight. Apple will unveil its latest generation of operating software for iPhone, iPod Touch and iPad, and its new iCloud service, at a press conference this evening. We'll have full coverage here on whathifi.com from 6pm UK time. The firm's Worldwide Developer Conference in San Francisco will see the launch of the latest iOS 5 software plus a cloud service called iCloud, which could be the company's long-awaited streaming music service. Also new will be Lion for Mac OS X computers, but there's no sign of any new hardware, meaning the iPhone 5 rumours can go on a little longer. The likes of Google and Amazon have recently announced cloud services, so it seemed only a matter of time before Apple joined the party.